“How do you talk about relationships of power with giant mounds of goo?” Noelle Mason asks as she pries small magnets out of metal clasps with a hand bandaged by duct tape. It’s a question that she has asked again and again in her work. Mason is an object-based performance artist. While her works demonstrate a high level of polish—even an obsessive attention to craft technique—they also have a strong experiential quality. 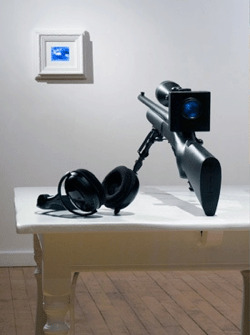 Mason makes frequent use of shock tactics and theatrical relationships between object and viewer. The work on display in “Bad Boys,” her solo exhibition about “hysterical masculinity,” demonstrates a thoughtful use of materials in collaboration with horrific content. In “Nothing Much Happened Today (for Eric and Dylan),” surveillance footage from the Columbine school massacre is hand-stitched into a cotton tapestry. In “Sonata,” laser-etched sheet music is produced from Al-Qaeda beheading footage, which was translated into a twelve-tone scale and transcribed, tattoo-like, onto calf’s-hide vellum. What happens when Columbine surveillance footage appears in the parlor-room palette and practice of embroidery? Formally, the pixilated image is re-rendered through the small x-stitches, and like its counterpart work, “Love Letters (white flag),” where the gunman’s diary pages are hand-stitched onto handkerchiefs, a memorializing effect begins to take shape. 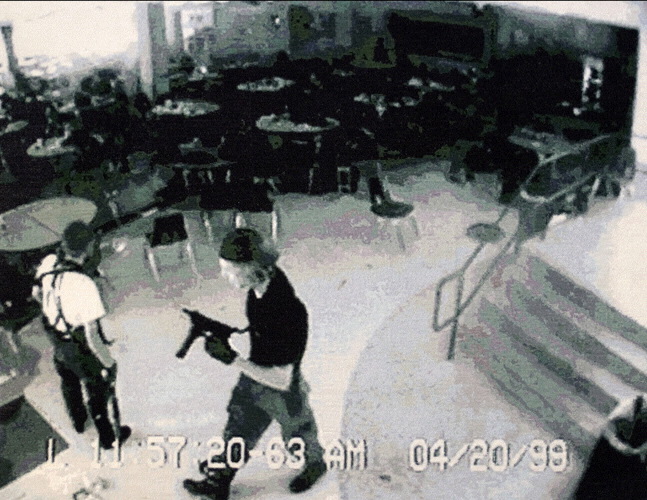 After ten years and several more school shootings, such iconic and horrific imagery becomes in danger of being commonplace. Mason’s background in performance leaves a pronounced mark on her object-making practice. Each piece has a time-based narrative experience. Like a performance, something happens. The viewer bears witness to something, often a traumatic image or event. As Mason describes it, this is the “persistent idea that art is digesting.” Mason sculpts open a space where harrowing cultural traumas like Columbine or televised beheadings get purged, cleansed or—given the presence of so much embroidery in this show—even domesticated. This idea is no stranger to the stage: it is the definition of catharsis. Noelle Mason shows at Thomas Robertello Gallery, 939 W. Randolph, through June 5.